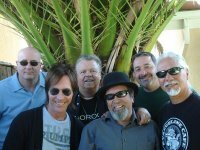 DG, Don Kirkpatrick, Randy Pybas, Frank Paredes, Danny Naccarato & Louie Ortega. Inspired by the re-release of several “Louie and The Lovers” recordings, Rio Salinas was formed by Louie Ortega, Frank Paredes and Randy Pybas. The release and conversion to CD’s by Bear Records even caught the attention of Rolling Stone Magazine who published a short article about the event. The three core band members are writing new material and we have already recorded several tunes. We are hoping to be back in the studio soon, so look for posts and the CD release. This is a great band that features Grammy Winner-Ortega, Original “Louie and The Lovers” member-Paredes, Don Kirkpatrick (Rod Stewart) & Danny Naccarato (Janie Fricke).